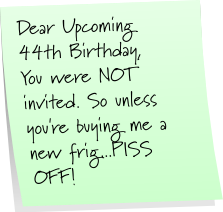 Yeah, so I'm turning 44 today. Please bear with me as I attempt to contain my enthusiasm. Ahem. A. I could impart some of my insightful wisdom and share the keys to the mysteries of life that I've acquired in my 44 years. B. I could make a list of the top 5 things I'd like for my birthday--if money were no object and the sky was the limit. Hmmm. Tough call. But I think I'm going with option B. What could be more fun than to share in my own self-serving personal wish list from the slightly twisted but Tinaliciously tasty world of birthday fantasy? So, without further ado or pomp and circumstance, here is my fantasy birthday wish list. 5. An all expenses paid trip to Paris and London. First Class, of course, with enough spending money to shop at all the Parisian stores I can't even begin to pronounce, and to buy all the tacky British souvenirs that backwards Yanks like myself are sure to enjoy. And while we're at it, I'll need enough money left over to hire a personal trainer upon my return home...because I'm sure to put on 20 pounds on such an inevitably food-filled trip across the pond. And trust me on this: I do not need another 20 pounds of junk in my trunk. The muscle shirt would be totally optional, of course. And just look at him, he's totally ready to make the bed. Or something. 2. For the Hubs to know what Duckie knows. Duckie is the character played by Jon Cryer in Pretty in Pink, one of my fave classic 80's flicks. In one of my all time favorite movie scenes, Duckie comes sliding into the record store where his friend Andie (played by Molly Ringwald) works, and he lip syncs to the Otis Redding hit, Try a Little Tenderness. And that song Duckie fake croons and dances to is the answer to many questions related to this girl's emotional highs and lows. Am I tired and grumpy? Try a Little Tenderness. Am I stressed from doing the unending weekly bills? Try a Little Tenderness. Am I less than affectionate when you're "in the mood." Try a Little Tenderness. Don't take my word for it though. Let Duckie tell you. 1. 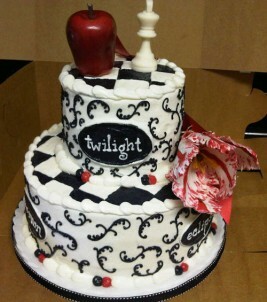 A Twilight-themed cake, hand delivered by R.Patz (a.k.a. Edward Cullen) himself. And I'll be a good girl. Really. I promise. I won't touch him or anything. So there's my birthday fantasy wish list, which took far too long to write. This 44-year-old brain just ain't what it used to be. Yeah, I should have stuck at 39. Is it too late to go back? It's my party and I'll whine if I want to. A lot of deranged people are making comparisons between Justin Bieber and Michael Jackson. 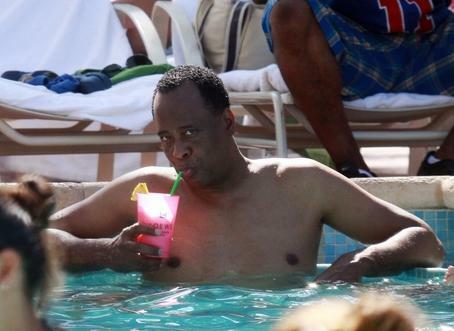 Some crackheads actually liken his talent to the King of Pop's. WTH? While I do admit the kid can sing, I don't think he's in the same stratosphere as Michael Jackson. I mean, come on, people. I suppose you're also going to tell me that Lindsay Lohan has the same acting chops as Julia Roberts? [Insert uproarious laughter here] Puhlease. The only thing those ladies share in common is red hair. So let's just keep it real, shall we? 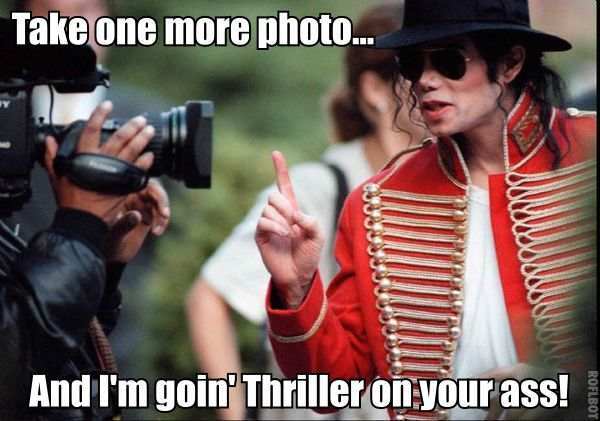 Anyhoots, a lot of MJ fans like to poke fun at the Bieberoni. It's all in good fun. And he is also a big MJ fan, from what I hear, so he gets points for that (at least he has good taste). 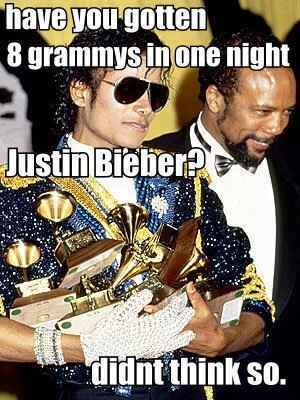 But I'm still gonna jump on the G-rated Bieber-bashing bandwagon for just a moment, as I share with you some Bieberific Michael Jackson memes for your Monday. And don't feel guilty for laughing at these memes. You can love the Biebs and still have a little fun at his expense. Or you can Blame it on the Boogie and be on your merry way. Whatevs. Labels: Meme Mania, Michael Jackson, MJ Monday, WTH? I'm feeling quite ranty (yes, I know that's not a word). 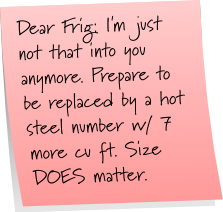 And that's always the perfect time to get the angst out on a Sticky Note Saturday! Have a good weekend, gang. 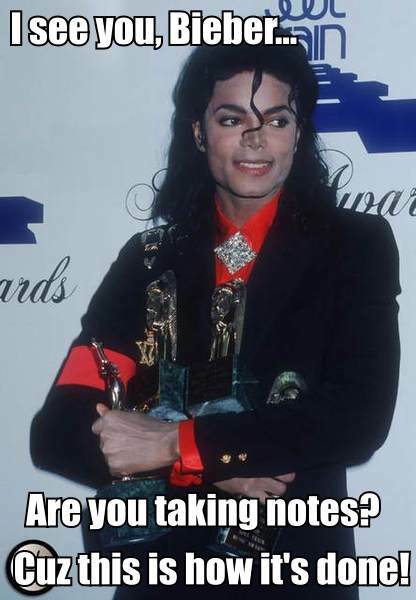 Not sure how I managed to miss posting my MJ memes last Monday...just because it was a holiday doesn't mean we don't need some awesome memes! But oh well...hopefully you'll enjoy these few I've put together for today. For me, it just ain't Monday unless it's a Michael Jackson Monday! Hope you have a Thriller of a day! But you gotta wonder what Sophia was thinking, don'tcha? from Sophia Loren, Jayne Mansfield and Me. Let me start by saying that I do not hate Paris Hilton. So any of you would-be PHF's (Paris Hilton Fanatics) and defenders can save your comments and your emails. I'm not about the hate. 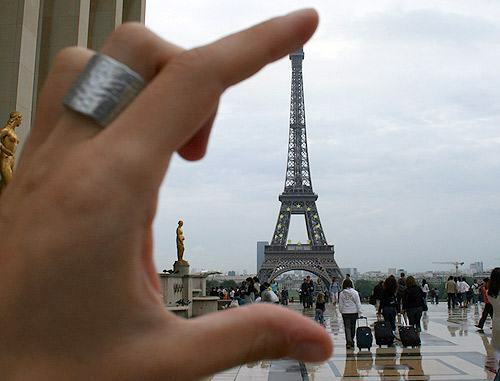 But I am about common sense, or the lack thereof as the case may be, with regard to Paris Hilton. She really just makes me scratch my head, so much so that I'm developing a scab where I do the most scratching. So figured it was just high time I asked Miss Hilton the requisite 7 questions...in no particular order, natch. How is it that you manage to look so freaking good in your police mugshot? I mean, it's a mugshot. That's even worse than taking a driver's license photo, generally speaking. Even on my best day, I don't look half as good as Paris does in her recent mugshot. And yet she looks like she just stepped into a celebrity photo booth or something. WTH? Seriously. Is it one of your duties as a celebutante heiress to routinely carry drugs around for other people? I'm not trying to be snarky here [I still love using that word], I just really would like to know. (Seeing as I'm not a celebutante heiress, this could be important information to have, should I ever manage to become one. ) Since you were questioned by police two other times this summer for carrying drugs that apparently did not belong to you, seems common sense would dictate that you wouldn't use that excuse do that again...um...unless it's one of your socialite duties or something. And if it is, maybe all you famous-for-nothing-folks should get together and form a union or something, and carry ID cards around that specify all of your drug-related obligations. At least then the police would know. How did you manage to confuse cocaine with gum? You told the police officer at the time of your arrest that you thought the cocaine he found was gum. Gum? Really? Now I've never used cocaine; I've never even seen it up close and personal. But I've watched enough TV shows to know what it looks like (that makes me an expert, does it not?! ), and it does not resemble gum. If it did, that would sure give new meaning to the words blowing bubbles, don'tcha think? Can't you find any other way to get publicity? I mean, seriously. Is your new catchphrase now going to be "That's not mine"? Not as catchy as "That's Hot," but hell, put it on a T-shirt and I'm sure folks will buy it. This is America, after all. Are you really just in a competition with Lindsay Lohan to see who can get arrested the most before the age of 30? Hmm. Or maybe it's to see who can get the best mugshot and reign supreme on the Smoking Gun. Yeah. Maybe that's it. Labels: 7 Questions, Rantics, WTH?